Corymbia variegata trials were established at Dean's Marsh (southern Victoria), Yahl (South Australia) and at Ryalston's (northern NSW) between 2003 and 2005. The Deans Marsh and Yahl trials were converted to seed orchards in 2009.
seedEnergy's Corymbia variegata seed orchard at Deans Marsh in 2012. 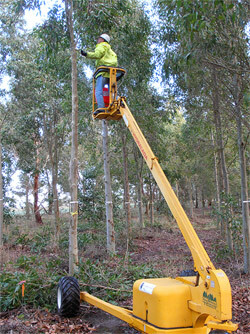 The trials comprised 40 native forest families collected from eleven different populations of Corymbia variegata. These populations represent a substantial part of the natural distribution of the species, thereby providing a broad genetic background. Stem diameter was assessed in the Deans Marsh and Ryalstons trials at ages 4 and 3, respectively. An analysis was undertaken by Dr Jo Sasse to examine growth at each site, evaluate the level of genetic expression on each site and the correlations between the sites, and identify the best populations and families for retention in the seed orchards. The Deans Marsh and Yahl trials were converted to seed orchards by culling the trials to 50% of their original stocking. Sasse, J. (2009). Preliminary analysis of Dean's Marsh (2003) and Ryalston's (2005) provenance–progeny trials of Corymbia variegata. A report to seedEnergy.